Elizabeth Marie “Betty” Benzie, passed away on April 2, 2019. Betty was born to Peter and Helen Delaney Benzie on October 18, 1928 in Sagola, Michigan. She graduated with a Bachelor’s degree in education from Northern Michigan University. Betty was a physical education teacher for 38 years in Fond du Lac. She was also the supervisor of the summer playgrounds for the Fond du Lac Recreation Department for many years. Betty was a member of the Altrusa Club, Fond du Lac Area Retired Educators, the State Teacher’s Association, FDL Coin Club and several card clubs. Betty’s parents passed away when Betty was a young age. She was blessed to be taken in by Fred and Romilda Benzie. Betty is survived by nieces and nephews, Joanne, Jan, Mary Lynn “Dusty” and Jim, other relatives and friends. She was preceded in death by her parents, Peter and Helen, as well as her loving guardians, Fred and Romilda, and their children, Fred Jr., Ward, Joseph, Roger and Gloria. 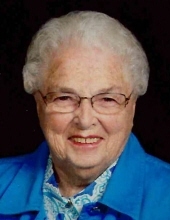 VISITATION: Betty’s family will greet relatives and friends on Thursday, April 11, 2019 from 10:00 to 10:45 AM at Holy Family Catholic Church, 271 4th Street Way, Fond du Lac. SERVICE: A Memorial Mass of Christian Burial will be held at 11:00 AM following visitation. Burial will be in Norway Cemetery in the Benzie family plot. In lieu of flowers, Betty’s request is memorials be sent to Holy Family Catholic Church or the charity of your choice. The family extends their gratitude to Dr. Michael Jones and friends, Arlene and Jennifer for their loving care. At Betty's request, memorials may be sent to Holy Family Catholic Church or the charity of your choice. "Email Address" would like to share the life celebration of Elizabeth Marie "Betty" Benzie. Click on the "link" to go to share a favorite memory or leave a condolence message for the family.